The word of mouth spread and compelled me to buy these three books together. I wanted to know what do this trilogy carry, that it has drove so many readers towards and what made Amish to have been called the Paulo Coelho of Asia. Hence with immense curiosity I turned each page. I was carried away by the story telling, I must admit. But there are few repetitive sentences for similar situations which pop up every 40-50 pages once, all along the three books. (Like a sentence that reads " This would be the guilt that he shall carry for the rest of his life". This dialogue gets repeated at least 5 times. And so is the phrase 'Started at'). Though the story line is strong with handful of unpredictable turns, the lines used for description becomes too predictable at times. 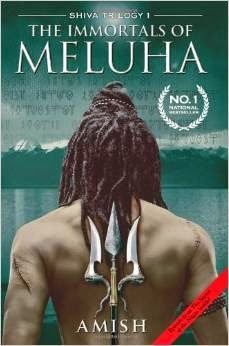 There are narrative flaws recognizable almost half way through his first book, "Immortals of Meluha". Then on, either I got adjusted with his style or Amish has improved within his book. I got engrossed so much that Shiva's picture in a calender at home began to show only his masculinity and warrior-like fierceness; The picture of Sati/Parwati began emanating a brave warrior's image; Karthik became my favourite strategist; Ganesh started appearing more calmer and secluded..Well! well! well! Enough for imaginations right? This book depicts Kaali (Hindu Goddess with Jet dark complexion and four hands) and Ganesha (Hindu God with an elephant head) as people with cancerous protrusions resultant of a side effect of the evil of Indus Valley civilization. It says all the war weapons named "Daivi Astras" were similar to nuclear weapons that we see now. Yes. Imaginations are good. There have been attempts by authors of various times at mortalizing the immortals (Gods). We have accepted them and encouraged them as well. This trilogy drags us deep into its story to a point where we get confused with facts, myths, mythology and beliefs. 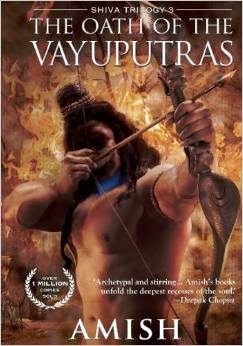 YES, Amish Tripathi's Shiva trilogy has definitely connection to our scriptures (like Shiva being 'Neelkanth', Shiva's third eye, Shaktipeetha's of Sati, Name and behavior of many Characters, part of Sequences in story,etc. ) and some of the parts are also purely fictional (story of 'Somras', conflicts among different empires, War at the end). -So it's neither totally based on scriptures nor totally fictional. 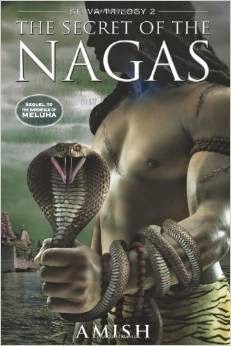 This book has to be read with a staunch foot-note that One needs to know about what Indian mythology says, before you put your hands on this trilogy, since you need to remember that this book is a blend of fiction and mythology, to a point of fiction again. - "There is my truth and there is your truth. As for the universal truth, it does not exist"